1. Cook the rice noodles according to pack instructions, then refresh in cold water, drain and place in a large bowl. 2. 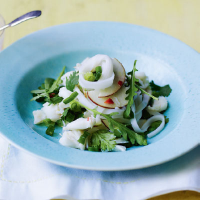 Slice the salad onions and add to the rice noodles along with the apple, crab meat, rocket and the coriander leaves. 3. Whisk together the juice of the lime, sunflower oil, chilli and sugar then pour the mixture over the noodles and season, then toss together and serve.